May not be that mysterious after all. readers will remember a couple of days ago when I put up my first post speculating about features seen on representations of a, I assume, proposed Lockheed Martin initiative: the 'CUDA' missile. I showed a 'rough estimate' of it's proportions and component locations IF the missile were truly "SDB-size". "My guess would be that this might be a large number of small solid rocket divert motors designed to help pitch the missile hard over in order to nail incoming jinking missiles head-on". While I wouldn't rule out the capability to pitch the missile hard over to get 'incoming', I'm convinced the 'divert motors' idea is 'spot on' for the missile concept as shown. I believe that if the details are ever revealed, in retrospect, this feature is easy to explain. 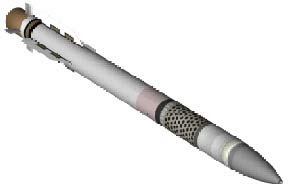 The ACS contains 180 solid propellant Attitude Control Motors (ACMs) that thrust perpendicular to the centerline of the missile to provide pitch and yaw control during the homing phase. The ACMs are spaced evenly around the centerline of the missile in rings containing 18 motors. There are 10 rings in the ACS in the longitudinal direction for a total of 180 motors. The ACMs are commanded by the Motor Fire Circuit (MFC). I submit that the ACMs are what puts the 'Hit' in "Hit to Kill" for the CUDA design. The discovery of what the magic spots were all about greatly simplified some assumptions that needed to be made as to CUDA missile weights, which in turn can give us clues in estimating performance. Rather than 'absolute' performance, I will be discussing the possible CUDA numbers in terms of relevance to AMRAAM performance. I'm doing this for a couple of reasons. First, there is an EXCELLENT discussion of air-launched missile performance in general and likely AMRAAM performance available as 'backgrounder' on a thread here. Second, the AMRAAM makes an excellent 'baseline' for comparative analysis. If the CUDA is as it appears to be, it is just under half the length of the AMRAAM. With most trade off variability in the CUDA WH and G&C weights. the fraction most important to get right is the RM propellant weight as a percentage (I used 85% as they did in the linked thread) of total RM weight. 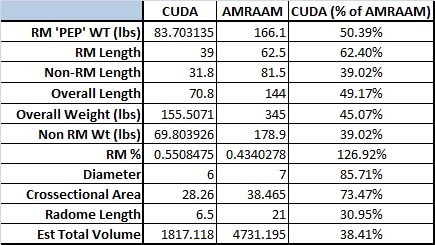 If we refer to the 'Delta V' formula at the thread I linked to above, and assume the CUDA uses the same rocket propellant mix that the AMRAAM does, we will find that the CUDA can weigh as much as 181 lbs, providing ~71.15 of the CUDA's 83.7 lb RM is propellant, to have an EQUAL top speed potential of the AMRAAM. As the discussion thread also notes, the AMRAAM isn't advertised to go as fast as the RM could carry it, because a percentage of propellant is reserved for a reduced 'sustainer boost'. This could also be true for the CUDA. 2. it appears the finnage and tail profile may be slightly higher drag features than the AMRAAM's (hard to tell, perhaps insignificantly so, or little better or worse either way), in all likelihood the Cd of the CUDA is approximately equal to the AMRAAM. We can reasonably conclude that the CUDA is a Medium Range Missile design, and approximate to the AMRAAM in range. I like the idea of an F-35 carrying 8-12 of these suckers and I'd like to see this kind of missile come to fruition. I'm MOST certain that if I missed anything on this late night exercise, SOMEONE will let me know. Did I mention we're basing all this 'estimating' on a convention display model, vague comments, and a computer graphic? Just FYI LOSAT and CKEM also used a similar pattern of thrusters so LM definitely has a handle on the technology. I am not sure of the physics involved for determining fin drag, but it seems to me that the fins on the CUDA are proportionally smaller than on the AMRAAM. This would also mean that they must work harder to control the direction of the CUDA. IMHO this is the reason for the ACM. It was a tradeoff; less drag in flight thereby better range but still maintaining terminal HTK capabilities. ACM is also going to be more effective than diverters on the CG as NCADE uses. Having the diverters up front means you can take advantage of atmospheric lift because you're change your AOA. The diverters on things like NCADE and KKVs simply "scoot" the vehicle side to side meaning they aren't going to have as much divert capability. @SpudmanWP if they fins are proportionally smaller, why would they have to work any harder? If they are smaller then it would take longer for a corrective action to take place. Think of a boat with a small tiller vs one with a large tiller. On the NCADE thrusters: Couldn't they move the thrusters to a position just behind the seeker. Maybe mid-body is better for ABM work? I think wing and fin drag (or any drag for that matter) aren't truly understandable unless you do the CFD modeling and wind tunnel work first. I would say the CUDA concept has bigger wings proportionally than the AMRAAM, but 'eyeball engineering' the aft steerable fins, I can't really tell the difference there. I think the CUDA concept wings are optimized for LO and compact carriage, and low aspect wings on missiles have been known to be beneficial at high speeds since at least the 60s, so perhaps there's a 'speed' reason for the wings as well. The big unknown in estimating drag is how the concept is to be controlled. How the surfaces are used (and 'shaping'of the flyout) will determine how much total drag will limit range. Is it a Skid-to-turn, bank-to-turn, or 'rolling airframe' missile? I'd guess it is a more efficient, less reactive bank-to-turn design, and makes up the end-game disadvantage with that method with using the ACMs. RE: LMs experience with ACMs. Their total experience struck me as impressive as well -particularly the use of ACMs on ever-smaller missiles. A question on the warhead: could a gimbaled explosively formed projectile be a viable design for an A2A warhead? You would need a very HOB seeker and very quick gimbal actuators but it would let you get away with a much lighter warhead. I don't know about viable, but it would be doable. The Navy took out a patent late 60s-early 70s where they had a warhead surrounded by detonators. Depending on wherethe target was in relation to the missile when it went by, the detonators would supposedly sequence to direct the blast in the right direction. I would doubt you'd want an EFP for air-to-air, as EFPs were conceived for cracking hard targets. EFP effectiveness is also very dependent on distance to target. Some anti-tank weapons use top-down attack with a WH that shoots downward over the target where the armor is ostensibly thinner among othrer things. I think your logic is sound concerning fractional explosive/shrapnel weight possibilities if you could direct damage where you wanted to, but the benefit may be eaten up by the structural, mechanical, and control system complexity added to steer and command the warhead. On an air-to-ground system, you could just fly the missile so it was a certain side up and send blast fragments and heat in the desired direction. Focus-able warheads is something they are working on and have demonstrated already. Thanks for the insights guys. 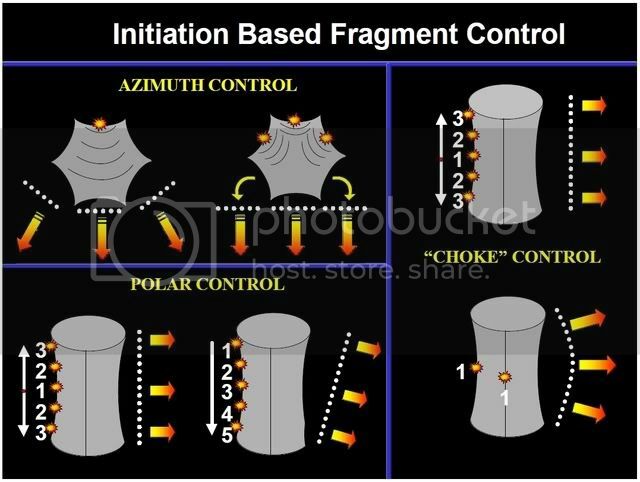 The focus-able warhead that SpudmanWP links to strikes me as a variable direction shaped charge that relies on a cone of fragments rather than a condensed jet of plasma (or copper penetrator) to do the damage. Do you guys have any links/insights on the seeker requirements for using focus-able warheads? Would laser proximity fusing be sufficient or would you need IIR or imaging radar? I am sure that, just like a bullet, some degree of fineness ratio and control displacement from mean center of lift will have to be considered to make sure that, whatever the burnout adjusted CG is, the weapon still has the relative control force to pivot about it's best AOA point for PN lead to intercept. Having said that, what strikes me about this missile is that it conceptually so closely resembles the front end of the AAAM LRAAM interceptor which essentially used the AIM-120/AIM-7M length parametric of around 12ft X7-8 inches to provide a very high impulse booster which took the weapon up to a very high loft and Mach and then dropped away, likely improving missile mass displacement for the _much smaller_ (6-8ft by 5.5 inches) terminal interceptor which then lit off a much different plateau profiled sustainer motor, based on prelaunch input trajectory commands. The idea being that you could coast and then relight to sustain a decent cruise Mach for max standoff in a frontal engagement situation (where the enemy missile nominally might be very threatening, closer in). Or burn all at once to overtake targets running away from the NEZ. You could even do a mixed profile attack where the missile relit for maximum acceleration only at the very end of the intercept, as when engaging low altitude threats where the drag was very high and the target very small (cruise missiles etc.). CUDA being similar to the front end segment of AAAM. Unfortunately, CUDA does something I disagree with which is replace the warhead with the ACM package. Which means your total motor length ratio doesn't improve in staying essentially at the mid-wing point. In this, it's important to note that AIM-120B and C pioneered MMICs which moved away from the hybrid circuits on the AIM-120A and, together with a better warhead, drastically shrank the GCS assembly, leaving a large void-space as growth room in the missile. AIM-120C5 added a 5" motor extension into this area. AIM-120C8/D (aka ERAAM) filled the remaining space up completely with a total 11" longer motor (which may also be gel now that I think about it). AMRAAM motor length thus increased _considerably_ during development. To me, this weapon looks like something the F-22 could get away with using if it had it's supercruise going (essentially the Raptor is making up for the absent motor length in the CUDA missiles, leaving more space for a sustainer or a variable throttle up peak system). But for a slow accelerating, largely transonic (M=1.2 best launch point), F-35, firing from much lower altitudes, the stumpier weapon is going to lead to less top end and no sustainer hold on whatever weapon VMax is achieved. I would work from the assumption that this weapon would not only be feasible but desirable, and then ask myself 'why?' it would be so. I take this approach for two reasons. One, my experience is that so many good designs don't ever get past the initial concept phase these days, I consider any that get into 'mockup for trade show phase' must have some attraction. Two, my 'detailed' knowledge on A2A weapon state-of-the-art is stale enough that I assume someone has added a twist since I last "did" Missile G&C work before moving to launch platforms. So when my attention was drawn to this development I did what I always do when I have to bridge a gap in my knowledge. Hit the relevant technical journals and archives. For example, I found the 'rocket motor' world had opened up quite a bit in the last ten years and there was no way I could make any reasonable assumption as to anything beyond using an AMRAAM-like setup for parametric comparison with the AMRAAM. In my parametric comparison I found it helpful to assume technology 'at least as good' where I did not have evidence of something more advanced. But as you note, the 'control' of the system is completely unlike anything else in the A2A world, so I focused my follow-on research on guidance laws and control schemes. In the former, I found in the IEEE archives how far we've moved beyond proportional navigation (PN). The advances in the last 20 years is staggering, and while I don't believe in 'AI' (like Roger Penrose, I say define intelligence first, then maybe we can talk), the potential efficacy of modern control laws (increased control logic variability by conditions and algorithms, some employing advanced 'predictive' logic) hardly resemble anything in the AIM-7F and earlier generations. Thought you might be interested in this. There was a recent (March 2015) Air Force Institute of Technology masters thesis where the author's sponsor is an IRAD project manager at LM's Missile and Fire Control. The thesis lists the weight of a CUDA-like missile at 49 kg. Apparently, the CUDA effort continues under the Small Advanced Capabilities Missile (SACM) effort. SYSTEMS" by a Maj. Connors. Marauder. I plan on posting a new CUDA piece tomorrow evening based on your excellent reference. Thanks again!